Why Do I Love Breakfast for Dinner? One of my favorite things to make for dinner is savory breakfast foods! I’m not a fan of savory foods for breakfast (hence my love of oatmeal) but it’s the best thing for dinner. So do I love it? First, savory breakfast foods tend to be pretty quick to make. My three favorite breakfast for dinner meals (that I will be sharing at the end) are all egg based and most cook up in less than 10 minutes. Which means I can make and eat something that’s not leftovers even when I’m on a time crunch! Not only is it pretty quick to make but it’s easy to change up the flavors of any of the dishes I’m about to share. Which, just like oatmeal, means I can eat it multiple times a week without getting sick of it. Unlike my husband, who can and has eaten the same exact meal for lunch and dinner, I can get burned out on eating leftovers for multiple days. The last reason I love breakfast for dinner goes along with how easy it is to mix up the flavors. It’s an awesome way for me to get in different kinds of vegetables! My go-to vegetable additions are spinach and sweet bell peppers but I also love mushrooms, tomatoes and broccoli in my savory breakfasts. Now, onto my three favorite savory breakfast for dinner (or for lunch) meals! I haven’t had avocado toast in a while but this was my go-to savory breakfast meal during marathon training (mostly as part of my post-long run meal). It was Mike who introduced me to over-easy eggs (which I was never a fan of until about two or three years ago) and this is my favorite way to have them. The combination of runny egg yolk and avocado (plus salt) is one of my favorite flavors and it’s so nice with the crunch of toast. This is my current favorite savory breakfast meal. It’s what I have most Wednesday nights after my run and before heading off to knitting group. It takes a little bit longer than just cooking scrambled eggs but I love the addition of potatoes. A tip for making this cook up faster is to microwave your potatoes (after they are cut up) with a little bit of water for about three minutes before adding them to the pan. This means they will get nice and crispy on the outside while still being soft on the inside! Making an egg bake is a new addition to my breakfast for dinner meal list. It’s a great way to make a large batch of food for Mike and me that lasts a couple of days without too much work. Basically all I have to do is mix together the eggs, vegetables, spices and cheese and then let it bake in the oven. I love hands-off cooking since in the time it takes this to cook, I can get in a quick core workout or some extra foam rolling. Do you also love breakfast for dinner? Share your favorite meals in the comments! What are my food staples? I’ve been noticing over the last year that I have a list of food staples. Things that, when I’m making my grocery shopping list, I make sure that I have it in the apartment. These have been a constant through my marathon training and into my cutting phase so they are definitely flexible foods. So here they are and how I use them! Lately I’ve been using bananas in almost every single post-workout smoothie. Freezing them makes it more voluminous and creamy plus eliminates the need for ice. I also love a banana in oatmeal with peanut butter. If you couldn’t tell by the fact that I’ve named myself the Oatmeal Runner, I love my oatmeal breakfasts. In fact, a lot of my staples are things I put into my oatmeal! It’s a warm, filling breakfast that is easily customizable. But uncooked oats also are great blended up in a smoothie (which I’m excited to get back to with marathon training!). I might not be able to live without peanut butter, it’s probably my favorite nut butter. Mostly, I’m using it in my breakfast oatmeal or Kodiak cakes but it’s also a delicious addition to mug cakes. Another oatmeal and smoothie staple is frozen berries. I keep a big bag of frozen mixed berries in the freezer at all times and it lasts me a couple of weeks. Plus, like peanut butter, it’s another great addition to mug cakes. I love my spiralized sweet potato noodles! They are great as a pasta substitute or made into hash browns. Other ways I use sweet potatoes is as baked fries (of course) or microwaved when I need a quick carb source. I’m loving cauliflower rice right now as a substitute for rice so I don’t use up all my remaining carbs on a ½ cup of rice (when I could have a ton of cauliflower rice). It’s a great way to add volume to my lunch and dinner while also adding in more vegetables to my diet. Lately, I’ve been on a spinach salad kick but I also love it cooked with my eggs or blended up in a smoothie. Again, another way to sneak in extra vegetables plus it doesn’t add much extra flavor to my smoothie. I have a ton of chicken recipes and most of them involve chicken breasts. But beyond all these recipes, chicken breasts just make an easy meat to cook when I don’t want to make a huge meal. All it needs to some spices and 25 minutes of cooking, then it can be eaten with almost anything! I love using eggs and egg whites anytime of the day. Mike actually got me into loving runny eggs (and my favorite brunch meal now is eggs benedict...unless there’s an awesome waffle option) and one of my favorite post-long run meals during marathon training was eggs in a basket. I’ve started buying egg whites by the carton to add into my oatmeal for extra protein since it’s a faster (and cheaper) option than cracking and separating whole eggs. What are some of your food staples? Let me know in the comments! Wednesdays are my mid-week long run days (currently at 7 miles) so I'm doing those before work to avoid the heat of the day (and so I can go to my knitting group). I thought this was a perfect time to do another what I eat in a day since I'm pretty set in my Wednesday schedule and I'm trying to get a larger amount of carbs in with what I'm eating after a run. Surprise, it's not oatmeal! I've been working through the strawberry waffles I made a couple of weeks ago for my breakfasts and this was the last one. How I'm warming them up is cooking them at 400º for 10 minutes on a wire rack which gets them nice and crispy. I've been topping these waffles just with a tablespoon of peanut butter since they already had strawberries mixed in. This time, since I had strawberries that had to be used up, I chopped a cup of them up and heated them in a coffee cup for a minute. This made them into a nice syrup that melted the peanut butter even more on the waffle. Paired with a mug of coffee with foamed 1% milk on top and it's a great way to start off the day. My post-run smoothie has come already! I had a good seven miles (as you'll see on the week in review that comes out on Monday) and headed to the gym to get in my foam rolling and get ready for work. I made up a smoothie the night before since I didn't want to start it at 6 a.m. and make the neighbors mad. As I mentioned before, I"m trying to get more carbs in post-run when I'm running in the morning. I was already getting in a good amount with the fruit in my smoothies but I was getting hungrier faster and thought more carbs could help. In addition to the banana and cup of frozen fruit, I threw in a cup of oatmeal right into the blender before mixing it up. And I feel like it really helped me at work. I didn't feel like I was ready to eat lunch right when I got into work at 10 a.m. which I have been the last couple of weeks. Since I am a creature of habit, I did have my lunch at around my normal 11 a.m. time. But no stomach rumbling as I heated it up like the past couple of weeks. 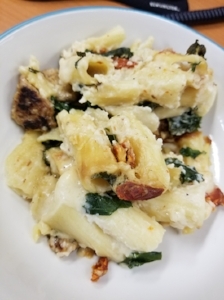 What I had was leftovers from Sunday night's dinner that Mike made, baked ziti with creamy kale and sausage, which was just as delicious reheated. Normally I'd have something else with my lunch like some fruit and greek yogurt but since I had the more carb heavy smoothie earlier I didn't feel like I needed anything else. Since I didn't have anything with my lunch, I did pack a mid-day snack. Usually I'll have this as my pre-workout for when I run after work but since I ran already I used it to keep my hunger down in the last couple of hours of work. I accidentally grabbed vanilla flavored greek yogurt when I went grocery shopping instead of plain so it's interesting having a favored yogurt again. 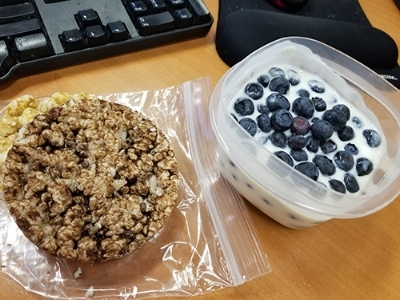 I added blueberries on top (thank goodness for fruit being on sale now) and chocolate and caramel rice cakes on the side. I'm seriously obsessed with rice cakes right now, to the point where I keep three different flavors in the house. They are the perfect little snack during the day to get in some more carbs but I can top them with whatever I want or add them into yogurt. What I had for my last two meals of the day was completely different than I had planned out. Normally, I go to knitting group on Wednesday nights and plan it out so I can have my iced vanilla latte there. But, with all the problems I've been having sleeping this week, I was feeling exhausted by the time I got done with work. I made a last minute decision to skip knitting group and relax at home in my pjs and knit. So, I mixed up my last two meals so I can have a little treat for my last meal. Instead of the leftover pot roast and vegetables that I planned, I had my favorite easy breakfast for anytime meal: an egg white wrap with mozzarella cheese. Usually I have a spiralized potato on the side but we didn't have any left so I skipped it this time. Final meal of the night and one of my favorite sweet treats: Halo Top! It's a bit more expensive than regular ice cream but I can have an entire pint of it at once without feeling guilty. And it's super delicious, I love the different flavors and the flavor for me is just like regular ice cream. Just with less fat and more protein. And that wraps up what I ate this past Wednesday. It was a pretty typical day to start out with but ended differently than my Wednesdays usually do. And that's just how I'm taking my marathon training. There's going to be days that I just don't feel like going out because my body is working super hard right now. And that's ok. I thought it would be fun to show you guys how I get in my calories on different types of workout days so I started with a long run day. This past Sunday, July 2, I had a 12 mile run in the morning and also ate out for dinner! If you checked out my Instagram story on that day, you would have gotten a sneek peek for this post. If you are interested about why I eat the way I eat, check out my past post on If It Fits Your Macros (IIFYM). For breakfast, I had coffee with 4 ounces of 1% milk (warmed up) along with oatmeal with peanut butter and raspberries. This is a pretty normal breakfast for me now and I knew it wouldn't bother my stomach during the run. Plus, PB&J oatmeal is just amazing tasting anyways. I ate breakfast at about 5 a.m. and would have enough time to digest it before we went out to the lakes. Since there was about 2.5 hours between when I ate breakfast and when Mike and I were going to start the run/bike ride, I had a small snack of rice cakes and raspberry spread before we headed out. Since I had planned most of my food out the day before, I knew I needed some more carbs in the day anyways and I knew I'd need a little snack before heading out on the run. Mike also had some rice cakes before heading out since the previous Sunday he didn't eat before and felt spent pretty quickly into the bike ride. Since I had 12 miles on the schedule for Sunday, I brought along a Gu and put Nuun in my water for the run. If I was running less than 11 miles, I would have just brought along plain water. I took my Gu (salted watermelon which was delicious!) at mile 8 and drank my water along the way (along with water out the water fountain). I made my post-run smoothie Saturday night, just to have one less thing to do before heading out and also because I thought my neighbors would not appreciate the blender going off at 7 a.m. on a Sunday morning. I packed in a lot to it because it would basically be my lunch for the day: blueberries, banana, spinach and protein powder. I drank it on the drive from the lakes to the gym to stretch and foam roll. After I got home (and showered), I took a nap since it was already noon and we were going to see an 4:30 showing of Wonder Woman. There was no way I was going to make it through a 2.5 hour movie without falling asleep if I didn't get a nap in. Even if we don't have big plans for later in the day, I feel a lot better if I get a nap in on long run days. Plus I get extra puppy cuddles since Vinnie usually naps with me. I ended up taking a shorter nap than I thought I would, so I had a coffee with a little bit of creamer while I worked on the blog. I didn't count those calories in my macros since it was only going to be a couple of calories and I don't need (or want) to be that on top of my macros. Yes, I brought in my own snacks to see Wonder Woman. We did buy a sparkling water to drink during the movie and there wouldn't have been anything that fit in my macros at the theater. I brought a chocolate peanut butter protein bar from Aldi (which was delicious and a great price compared to other protein bars) and a serving of chocolate chip cookies from Naturebox). Since I hadn't eaten anything since about 10 a.m. (and it was now 4:30 p.m.), I ate my snacks by the time we got through all the previews. I wasn't super hungry at all, probably because I had the coffee and that suppresses my appetite some. Also, if you haven't seen Wonder Woman yet you should because it was an awesome movie! Finally, at about 7 p.m., we had dinner at Chipotle right after. We haven't it in a while and it was a really good way to end the night. I got my usual steak burrito bowl with rice, black beans, cheese, tomatoes and lettuce while Mike had an overstuffed steak burrito (plus a beer because he could). And that's what I ate for my long run day! Not a typical day of eating for me since I worked my macros around what we were doing that day while making sure I had enough to eat before and right after my run. I'll probably do another long run what I eat in a day later on in my marathon training when I have upped my macros (along with what I eat in a day in a couple of other days in my training schedule).